Water pollution is a significant environmental problem. Success or failure of water pollution control policy depends primarily on effluent standards, monitoring systems, and central–local government relations. This paper focuses on the relationship between the central government and the Kanagawa Prefecture government in Japan concerning the history of water pollution control policy from the 1950s to the early 1970s. Kanagawa Prefecture is next to Tokyo, and the Kanagawa Prefecture government has been a leader regarding environmental policy at the local level in Japan. 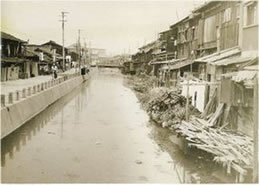 This paper examines two aspects of water pollution control history in Japan. The first is the reason behind the implementation of a unique water pollution control policy by the Kanagawa Prefecture government against the central government, although two of its governors were conservatives. In other words, this paper examines what other historical factors exist to promote or formulate water pollution control policy, other than ideology. The second aspect involves examining what central–local government relations mean, how they change, when and how national policy change affects local policy change, and vice versa.